Are you embarrassed to have impromptu company? Do you come home from work only to be faced with piles of clutter in your living areas and bedrooms? If this describes your current situation, the closet specialists at ABC Closets can make the difference you’ve been dreaming of. From custom closets in every bedroom, to custom garage organizers, laundry room cabinets, custom wine cellars and more, we can build you storage solutions that will allow your home to shine. 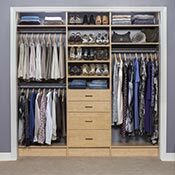 If you have been considering home improvement options, custom closet systems are a great place to start, as they bring home organization to every room and storage area in your house. "Hi Tony, your installers just left my house about an hour ago and my closet is almost filled again. First let me say that Mike and TJ were very nice and very professional. They did a fantastic job. I cannot tell you how much I love the closet, it really looks great. I am so happy that I contacted you again. I will be recommending you to all my friends." "Thank you to the team at ABC Closets. Tony came to our house and provided great ideas and expert designs to organize our garage. Mike and Keith the installers showed up early and finished the job in one day. We highly recommend ABC for all organizing needs." Struggling with closet organization is not a character flaw. In fact, it’s common! At ABC Closets, we specialize in helping homeowners get organized and increase space. With many closet companies in New Jersey to choose from, you will want to be sure that the professional you hire to design your closet is the best. We offer organizers for every room in your home. Every closet design we create for both walk-in closets and reach-in closets is an original! 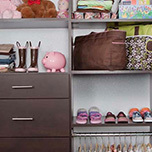 A closet organizer system can change the way you look at these small storage spaces in your home. Is the heart of your home failing to provide you with a space to meet your family’s physical and emotional needs? 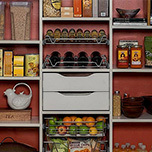 A custom pantry can help you organize this space with pull-out shelves, bins, accessories and more. 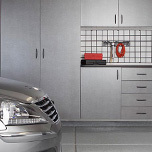 Our garage storage systems include garage cabinets, shelving, overhead storage options and more! 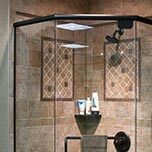 Get this area organized once and for all with our variety of organizers and other products. 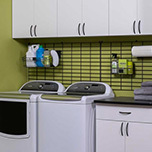 Our closet installers are ready to design you the laundry room of your dreams! From laundry room cabinets to shelving, a fold-down ironing board and organizers galore, doing the wash can be a joy. Your Closet Designer Is Ready to Get Started! 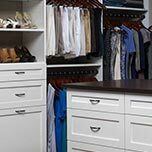 Whether you’re looking for a built-in closet, more garage storage or organization solutions in any room of your home, now is the time to call ABC Closets. One of our closet designers would be happy to meet with you, at no cost, to discuss the various options available and to give you a price quote. Please call today to schedule your free consultation.